Last Updated: April 21st, 2014. 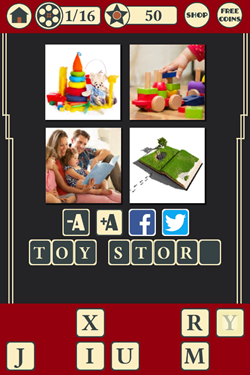 Alternatively, below are all the answers to the 4 Pics 1 Movie game app for the iphone, ipad, and ipod touch, developed by Game Circus LLC. **IMPORTANT:** The levels will probably be in a different order on your device than what we have below, because each time the app is installed the level order is randomized. You can probably find the answer you’re looking for faster by using the word solver above. « World’s First Hoverboard or Blatant Hoax?